It’s the first of the month, and than means it’s Theme Day for participating City Daily Photobloggers. This month’s theme is Contrast. Lovely, mesmerizing contrast. 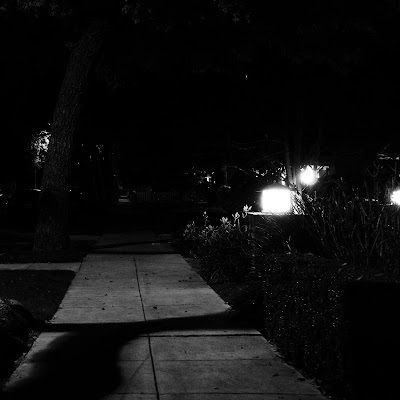 It’s why I adore monochrome photography and night shooting — all those dark darks and silvery lights turn my little bedroom community of South Pas into a film noir playground. Contrast creates the shadows… and everyone knows that it’s the monsters in those lurking shadows that make the bright light feel so comforting. Contrast is why I adore complicated people — all those incongruous non sequiturs and seemingly incompatible views. Contrast makes us honest. It highlights all the bumps and cracks. And it’s the best part about happiness. After all, without bad as contrast, good is just the same old boring status quo.